A brand new IP from Crytek and Microsoft is upon us and has arrived to much anticipation, but will the new brand be able to have a breakout debut on next gen consoles? The Classic Tale: Ryse, a launch title for Microsoft's answer to the next generation of consoles, puts you in the role of Marius Titus as he rises through the ranks of the Roman empire and eventually embarks on what is described as "an epic tale of revenge". The storyline basically revolves around Marius attempting to hunt down and kill the corrupt high ranking officials of the empire and along the way he does a lot of slaughtering of anyone he can lay his blade into. The plot is fleshed out I suppose but it is terribly cliche and stereotypical of so many books and movies that describe tales of revenge in that time period. Ryse does not focus heavily on the story so much as it does the gameplay in between the cut scenes but perhaps that is not a good thing. Pretty And Shallow, How Typical: The gameplay of Ryse is in a similar vein to God of War or any other modern hack-and-slash title that sees you mow through waves upon waves of mindless enemies. Unless you are playing on the two highest difficulties, which are admittedly fairly troublesome, the game is laughably simple and quite easy. As the one man army that is Marius Titus, you will be pushed along remarkably linear paths in which swarms of enemies block your path. With only a sword and a shield your attacks, the assaults of your enemies and the battles as a whole tend to quickly become simplistic and repetitive. You are capable of blocking and countering attacks but generally every battle has a far too similar feel to it, as you execute repetitive attacks that often culminate in gruesome finishing moves. These moves will see you lopping off limbs and maiming your enemies in a few different ways but the game sheds so much blood constantly that the shock-and-awe factor of it quickly diminishes, similar to another poorly received title on the Xbox 360 called Golden Axe: Beast Rider. 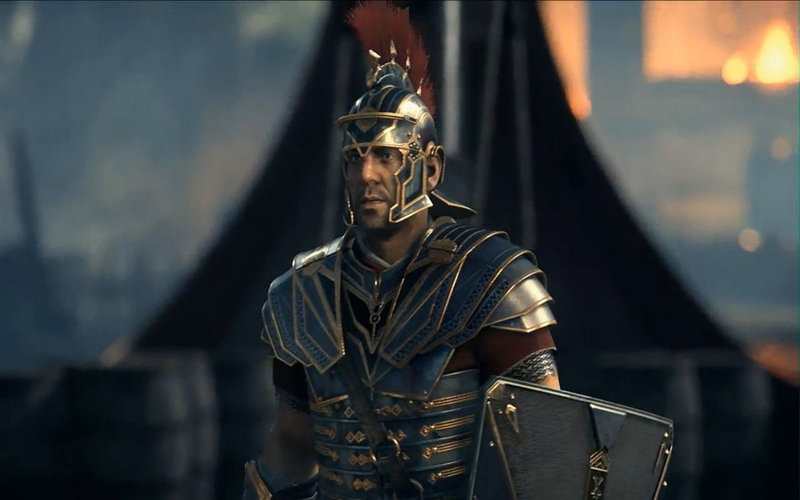 The Sweetest Eye Candy: Ryse does excel in one area though, boasting remarkable visual superiority. It is the finest graphical wonder that the Xbox One can lay claim to and are quite impressive in many ways. The environments and characters are wonderfully detailed, looking more akin to a movie than a simple video game. Visuals, particularly in combat, are awe-inspiring and will continue to impress you even if the lackluster and redundant gameplay does not. Rent vs. Buy: Ryse seems to be little more than a title that displays the graphical capabilities of the Xbox One. As far as gameplay goes, it is laughably shallow and I consider it to be insulting for such a run of the mill hack-and-slash title to be put out on this generation of consoles. Make no mistake, Ryse is a graphical powerhouse but that alone cannot make up for the repetitive gameplay and incredibly limited, linear progression throughout the campaign.